As the most ardent followers of this site will know, many of the advanced statistics that are presented here are heavily influenced by hockey analytics. Our tracking of Controlled Zone Entries & many of the graphs that you see on this site are directly influenced by the fancy stats world of the National Hockey League. One of the most commonly used advanced stats is known as Fenwick (named after the Calgary Flames blogger Matt Fenwick – who first started applying the stat to his coverage of shot totals). What is Fenwick? It simply is a tally of total shots (either on target or off target) but the catch is that it excludes blocked shots. The idea being that blocking shots is actually a defensive skill, so why punish the defending team by dinging them with a shot against? In reality, a solid defensive play actually prevented a shot from going on goal. After watching Morton block six of Rangers’ shots this past weekend, I was inspired to begin factoring in blocked shots while keeping track of Rangers’ shot totals. Below you have each players’ shot totals, along with how many of their shots were blocked. The final column is for the players’ Fenwick total (shots minus blocked shots). The next step is to see the difference that blocked shots has on a player’s shooting accuracy. For example, Jason Holt has a shot accuracy ratio of 0.478. Of his shots, 48% are on target – either forcing the keeper into a save or beating him for a goal. But if you adjust that percentage by taking into account his seven shots that were blocked – it translates to a Fenwick Adjusted Shooting Accuracy of 0.688. That’s right, 69% of Holt’s shots, that are not blocked by defenders, end up testing the keeper. 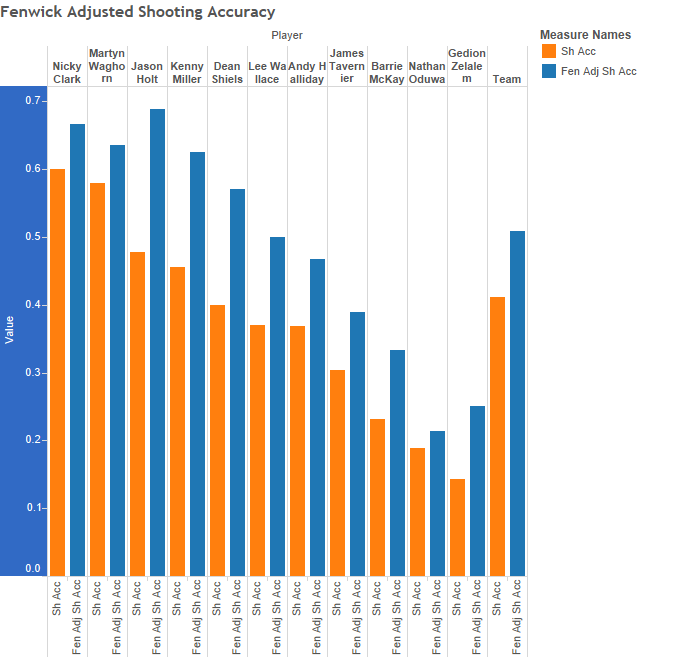 Here you have a graphical representation of each player’s shooting accuracy compared to his Fenwick Adjusted Shooting Accuracy. Note: Only players with a shot blocked are included. Like we saw in the Jason Holt example, when you subtract blocked shots from a player’s ratios you can see some marked improvement in their shot efficiency. Kenny Miller goes from 46% of his shots being on target to 63%, Lee Wallace goes from 37% to 50% & Dean Shiels goes from 40% to 57%. Even Barrie McKay’s shooting accuracy looks slightly better then the woeful ratio of 0.231, as his Fenwick Adjusted Shooting Accuracy is all the way up to 0.333. Lastly, while there has been recent criticism of Rangers ability to finish, & much of it is very warranted, it is interesting to see them go from getting 41% of their shots on target (which matches the league average) to 51% of their unblocked shots being on target. Half of Rangers 17.8 shots per game are testing the keeper & without tracking the rest of the league’s Fenwick numbers (yet) – it is safe to assume that is a pretty high rate.